The saga of the Mortal Kombat Encyclopedia has been a long and winding one. Mortal Kombat Online first reported on mounting fan interest for a printed tome in the middle of last year [full story]. In the time since, the project has evolved and escalated under the guidance of dedicated fan aka; Myke Snow. Support for the We Want An MK Lore Encyclopedia petition has reduced to a steady trickle in the past eleven months, last achieving the 6,000 e-signature milestone. Enthusiasm from die hard supporters, however, has remained an intense, undeterred torrent of moltenous passion! The subsequent contribution of additional champions, such as designer Anthony Wenc and the @EncylopediaMK Twitter account, has kept the concept alive and developing before our very eyes. Wenc's designs in particular lend further credibility to the concept, bringing the sensibility of newer mock-ups even more in line with existing Mortal Kombat products. Exactly what's stopping the publication of an MK Encyclopaedia is a little uncertain, but it's likely there are multiple factors in consideration. The demands of a definitive source certainly ask creative questions the developers have shied away from in an era defined by inconsistency, retold history, and other development priorities. A franchise reboot in 2011 muddied the waters of Mortal Kombat's once steady and expanding lore. The introduction of third-party content through DC Comics, while enjoyable for fans, further imposes inconsistency incompatible with an authoritative encyclopaedia publication. Comics writer Shawn Kittelsen has shown support for the project, but parent companies may prefer the ambiguity supplied by the modern games. The greatest c hallenge of an in-fiction encyclopaedia: quality control. The most important factor behind any printed Mortal Kombat source will be interest from cash carrying consumers: the fans. You can show your support by signing the petition, following @EncyclopediaMK and making your voice heard through constructive comment on the forum! Register to find and discuss all products coming from the Mortal Kombat license in the Media & Merchandise forum! Support the kommunity by liking and sharing all things Kombat via @MK_Online, Facebook & YouTube! My god that Reptile page is amazing! Gotta give major props to making it to 6K. Happy to have helped spread the word and more than happy to keep helping this project move forward as much as I possibly can. We should all be doing our part to get this in front of as many eyes as possible. Keep on pushing guys, let's get this thing made. It doesn't look like we are making enough progress with the petition for them to make it...somebody ask them on twitter if they are willing to accept a community fund? Killer Instinct had one to make Shadow Jago his ow character with new moves etc. and the fanbase raised more than enough money in a single day for them to make Shago...we can do the same for this. If we post links here, TYM, TRMK, wherever I am sure we can raise the money. WB has forbidden us from doing crowdfunding. If the publisher the project leader is in talks with isn't able to help us convince WB/NRS, the only way the book will come out is if we do it ourselves and charge people the exact printing price. For those who don't know, I'm the guy who did the minimalist mock-ups. 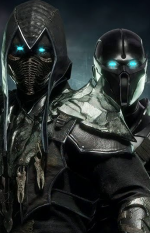 They were done that way to mimic the design of MKX and give the content more importance. The one in the article is also mine but it's an old one while we were doing "alpha" mock-ups to find out how we would present the content in the real mock-ups. Here are the 4 mock-ups that ended up in the prototype book. You can click on them to see a bigger version. Absolutely, and what's missing from that post is that one of our prototypes (We had 5 physical books made) is sitting inside NRS right now. The others are in the following places: <br/>1: Galloping Ghost Arcade / With Daniel Pesina <br/>2: Warner Bros Consumer Products <br/>3. Prima Games (I called to confirm they have it.) <br/>4. John Vogel <br/> <br/>Mind you, we are getting 5 more made and sent out to various social medias, but we are busting our butts to get this book to be a real thing. The REAL book probably won't look like the mock ups, but we want to show them the possibilities. <br/> <br/>As of now, DK Books, Prima and a Third Unnamed publisher are interested in this book. I can't name the 3rd one because I've been asked not to include them until they know for sure if they can get clearance. <br/> <br/>We ask that folks keep pestering NRS and Boon and company. This will only help our cause! Mind you, we are getting 5 more made and sent out to various social medias, but we are busting our butts to get this book to be a real thing. The REAL book probably won't look like the mock ups, but we want to show them the possibilities. As of now, DK Books, Prima and a Third Unnamed publisher are interested in this book. I can't name the 3rd one because I've been asked not to include them until they know for sure if they can get clearance. We ask that folks keep pestering NRS and Boon and company. This will only help our cause! If this project ever comes to fruition, hopefully Noob Saibot's name in the Netherealm section won't be improperly hyphenated. John Vogel got a copy of the prototype yesterday, and needless to say he was impressed. I don't think anyone really appreciates what we're doing until they get one of these in their hands. It's a different story, then. <br/> <br/>Another copy is waiting for Ed when he gets back. I'm flying to Chicago today (In a couple hours) and one of the days I'm there I'm going to try and swing by NRS to try and talk to someone who can help me out in getting this book made. <br/> <br/>Also going to stop by GGA and play some old school MK and possibly meet up with some MK folks. <br/> <br/>So we are gaining some steam here, folks. It's just a little, but it's enough to be exciting! John Vogel got a copy of the prototype yesterday, and needless to say he was impressed. I don't think anyone really appreciates what we're doing until they get one of these in their hands. It's a different story, then. Another copy is waiting for Ed when he gets back. I'm flying to Chicago today (In a couple hours) and one of the days I'm there I'm going to try and swing by NRS to try and talk to someone who can help me out in getting this book made. Also going to stop by GGA and play some old school MK and possibly meet up with some MK folks. So we are gaining some steam here, folks. It's just a little, but it's enough to be exciting! *Finally signed. Why isn't this a thing yet? MK Wiki is great n all, but it's still full of spelling/grammar errors, and some erronious misinformation. Not entirely sure, tbh. We do think the physical books are helping things along, though. <br/> <br/>We have sank several hundred dollars into it, so there's really no turning back now. Not entirely sure, tbh. We do think the physical books are helping things along, though. We have sank several hundred dollars into it, so there's really no turning back now. Noob Saibot's real name is traced back to Bi Han yet the goof ball(s) put his species as unknown and origin the Netherrealm? ... talk about being inconsistent. Omg, I love these!! I had signed the petition for an MK Encyclopedia more than half a year ago and kind of forgot about it because NRS hasn't followed through, but damn! The imagery and detail put into these pages are great! Very eye-catching. <br/> <br/> However I do agree with the above post that there are a few tidbits of information that I would correct, alter, and tweak. <br/> <br/>Still, if this or even another type of official MK Encyclopedia gets released, I'd buy. Omg, I love these!! I had signed the petition for an MK Encyclopedia more than half a year ago and kind of forgot about it because NRS hasn't followed through, but damn! The imagery and detail put into these pages are great! Very eye-catching. However I do agree with the above post that there are a few tidbits of information that I would correct, alter, and tweak. Still, if this or even another type of official MK Encyclopedia gets released, I'd buy. Honestly I am not really into it at all but it's great to see the fans making all of these efforts in the things they love. WB isn't really known for it's appreciation of fans' work. They DON'T CARE. Ed Boon doesn't care either. I think they will kill it and promise the community an official made one that will be half a**ed and pricey as hell. <br/> <br/>On another note, if miraculously picked up by WB, you guys need to ask em for the never released/before seen stuff to include.. dropped concept, characters' designs and arenas. Honestly I am not really into it at all but it's great to see the fans making all of these efforts in the things they love. WB isn't really known for it's appreciation of fans' work. They DON'T CARE. Ed Boon doesn't care either. I think they will kill it and promise the community an official made one that will be half a**ed and pricey as hell. On another note, if miraculously picked up by WB, you guys need to ask em for the never released/before seen stuff to include.. dropped concept, characters' designs and arenas. We have gotten that vibe from WB, but not from other folks. We are still trying. <br/> <br/>Our current push right now is for the 25th anniversary. If not for that, then to come alongside next MK game. We just shot our pitch to NRS today. We have gotten that vibe from WB, but not from other folks. We are still trying. Our current push right now is for the 25th anniversary. If not for that, then to come alongside next MK game. We just shot our pitch to NRS today.